Legendy scény, italští NATRON, byli jednou z prvních kapel v Itálii, která byla svedena globálním rozmachemdeath metalu. Vznikli v roce 1992 a bylo to jejich první album 'Hung Drawn & Quatered' (Headfucker records) z roku 1997, které je představilo celému kontinentu. Tak tvrdě jezdili turné, že na sebe strhli pozornost francouzského labelu Holy records a nahráli u nich jeho pokračování s Peterem TÄGTGRENem z HYPOCRISY v Abyss Studios ve Švédsku. V roce 2012 se zrodilo dlouhohrající 'Grindermeister' a automaticky si tím zajistili místo na pódiu na OBSCENE EXTREME 2013, a to nejen svým znepokojivým, oldschoolovým, technickým deathmetalem, ale i svým strhujícím obalem ve stylu TERRORIZER!!! 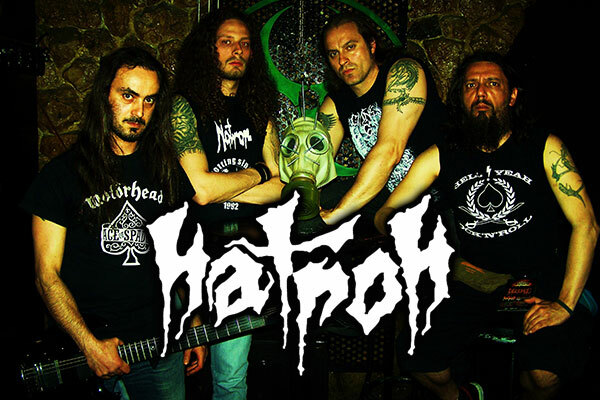 If you're talking about death metal and looking to Italy you cannot do it without referring to Natron. Initially influenced by certain 80's thrash metal ala Coroner, Voivod and Slayer and by the uncompromising brutality of death/grind masters like Suffocation Napalm Death, Terrorizer, Entombed , NATRON are now legendary purveyors of a unique blend of death metal and grind core. Hailing from the igneous shores of the mighty south of Italy , Natron formed back in may 1992 and since then their sound is considered a sort of benchmark which constantly evoluted through their 7 records. After two demo tapes, “Force” (november 1994) “A taste of blood” (july 1997) and a mini album “Unpure” (recorded in april 1996 but finally released by Nocturnal Music in november 2000) they released their 1st full length album “Hung, drawn & quarterted” (Headfucker Records) in december 1997. .After signing with the France based Holy Records the band released “Negative prevails” (june 1999) and “Bedtime for mercy”(november 2000) both recorded in Sweden at the legendary Abyss studios. Then came “ Necrospective” (september 2002) to celebrate the first ten years of the band and their most critically acclaimed album “ Livid Corruption” in november 2004. Five years of extensive touring, serious line up changes and with a long record deal expiring, the band were forced to put back their 6h full length studio album “Rot among us” (Metal Age Productions) til ( 20 ) October 2009. In almost 2 decades of intense touring and festivals appearances Natron played every corner of Europe sharing the stage with the bestworld death metal acts around. Renowned for being a hard working band, these veterans solidified their status of respectable european old school death metal band and after that nicknamed “ the italian godfathers of death”! After touring massively Europe and the Balkans between 2010 and 2011, in March Natron enter the studio to re-record old songs included in the debut album and mini for a new brutal release. This work marks the return to the good old brutal times, a sort of “back to basics” album to get the old brutality out to the newer fans who missed the early days of the band. The “Grindermeister” album is out now in March 2012 and celebrate 20 years in the life and career of Natron: make sure to check these songs live throughout the 2012!!! !